Please Note: Unfortunately, ABC Family Movies are not always Family - Friendly. For this reason, and due to it's rating, I have removed this movie from the Family TV Schedule. Can love survive everything – even the past, present and future? In the movie Barry’s character, Pax, comes from the future, where there isn’t love. He visits present day New Orleans in search of romance novelist Elizabeth Barrett, played by Sara, whose book his culture found during an archeological dig in the year 3125. Pax hopes that Elizabeth will be able to describe the concept of love to him so he can bring it back to the future. Valerie Harper will play a colleague of Elizabeth’s, and Fred Willard will play the character, Bob, who is Pax’s superior in the future who helps him go back in time. Please Note: This Movie was Rated TV-14 with a Caution of Language and Dialogue. I found the characters to be just as odd as the story. It was rather silly and cheesy. This guy, P-A-X-497/341 (AKA - PAX, played by Barry Watson) comes from the future to the past – which is our present day, to try and discover what the word Love means. In the future the word Love doesn’t exist and people seem to be without emotion or feeling. When PAX goes out to eat – he doesn’t recognize common foods or music. Elizabeth Barrett, (played by Sara Re) is a Romance Novelist, who is intrigued by PAX and his quest for discovering Love. She is already involved with someone, yet finds herself attracted to PAX. If you like futuristic movies or a bit of Sci-fi, then this might be interesting to you. 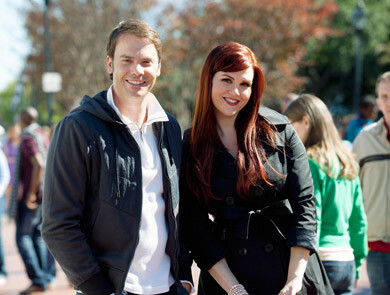 Or, if you are a fan of Sara Rue, who is always sweet, quirky, and delightfully fun in any role she plays... then you’ll want to see this. Fans of Barry Watson, who is a handsome guy, may not quite recognize in this as he seems strange, somewhat nerdy, odd, and a bit nutty. All in all, I won’t tell you exactly how it comes about... but there is a future Happy Ending for PAX and Elizabeth .... a great ending to an odd, but sweet... Romantic Comedy. Remember, it is Rated TV-14. If it sounds interesting to you, then see it. It is kind of out there - but cute!